With Virginia losing one of its most important pieces in DeAndre Hunter, will they be able to make it to the Final Four or will the usual suspects Villanova, Duke or UNC still reign at the end of the Tournament? Let’s check our ranking on this first day of the March Madness. Talent, experience, depth. 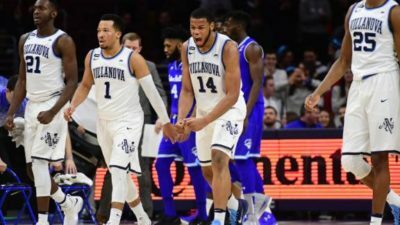 Despite some struggles in February, Villanova won the Big East title and is ready to dance all the way to the Final Four. The Wildcats also have the easiest path to do it with no other top favorites in their region. Brunson (19.5pts 4.7as) and Bridges (18pts 5rb 2as) are the leaders of this team which has already won it all two years ago and may want to catch another title before leaving for the NBA. If they hadn’t lost against Michigan for the Big 10 title, they may have got a number one seed. Instead the selection gave them an awful #3 seed, which means they will have to beat Duke and then Kansas to make it to San Antonio. The Spartans’ combination of big bodies (20rbds per game for Jackson, Ward and Bridges) and shooting (41% from 3 for the team) will be hard to stop. Everything was going so well…until the news of De’Andre Hunter injury broke out. The Cavaliers live for defense, they are the quintessence of college basketball, a no-star-but-big-heart team with every player understanding his role. Kyle has been the Guy (16pts 4as vs UNC), well helped by Hall and Jerome (22pts 7rbds 7as combined per game), yet Hunter was this glue guy that the Cavaliers may miss so much in the Tourney. UNC is proud, they have a title to defend and March is the start of a new season. They had a pretty good ACC tournament with an important win against Duke before falling to Virginia. Mayes (17pts 10rbds 1blk) and Berry (17pts 3.3as) are the heart and soul of the team, and you should never underestimate the heart of a champion. Michigan seems to be the toughest opponent in their region, but there will be room to get a spot to the Final Four. 3,2,1, shoot!! Despite Azubuke’s absence, the Jayhawks won another Big 12 tournament with the foursome of Graham, Mykhailiuk, Newman and Vick making 15 of their 27 threes. If Azubuike is healthy again, Kansas will be dangerous. The team is experienced, but they will have a probable tough matchup against Duke or Michigan State. The Wolverines won their nine last games including two major wins against their in state rival from Lansing and Purdue to get the Big 10 crown. Moritz Wagner is the man (14pts 7rbds), but Michigan will at least have to beat a tough UNC team to have the chance to play for a seat at the Final Four. Duke may have the best duos of inside players in Bagley (21pts 11.5rbds) and Carter Jr (14pts 9rbds 2blks) and outside shooters with Allen (16pts, 38% 3pt) and Trent Jr (14pts 41% 3pt) but they have a big weakness, Trevon Duval. One of the most hyped PG at the beginning of the year, Duval has been very disappointing lately. Over his last five games, he had 29as for 16tos, with only 20pts scored during the stretch. If he can’t play like the first round prospect he’s supposed to be, Duke will never be able to make it through Michigan State and Kansas. DeAndre Ayton (20pts 11.5rbds), that’s the first reason why Arizona is dangerous. Add Trier (18.4pts 3.3as) and Alkins (13.4pts 4.8rbds) and things get even scarier. Despite all the turmoil, the Wildcats got the job done by winning another Pac 12 title and will give their best to have the opportunity to beat Virginia, their toughest matchup in the South region. You can’t teach size, ask seven footers Haas (15pts 5.6tbds 1.5blk) and Haarms (5pts 2blks in 16min). If it wasn’t enough, Purdue’s armada of shooters (both Edwards, Mathias Thompson and Kline) has averaged more than 40% from 3 with a high volume of shots (more than 20 attempts per game). The Boilermakers have all the tools to make a great run. The ultimate mid major underrated team, The Zags have become one of the most consistent teams in the NCAA and proved it last year by reaching the Final Four. They haven’t lost a game since January 18, thanks to the great efforts of Tillie (24pts per game over the last three games). The weakness of their conference schedule might also be a disadvantage as they didn’t face big time competition except St Mary’s during the last three months. Next Next post: Franchise players vs Glue Guys, is the money always worth it? Part 1, like glue.